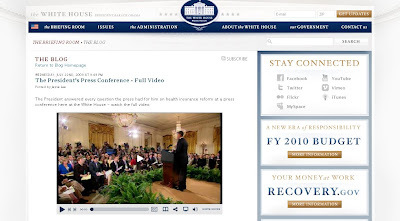 After VP friend Chris Soghoian pointed out the problems in having the White House use YouTube to post speeches for citizens to watch, particularly since viewers may be unaware of the ways this commercial site compromises their privacy, staffers from the Chief Executive experimented with a number of other online video players for a short time. But then it seemed that the webmasters for the Obama administration returned to their corporate software standby, YouTube, for several months. 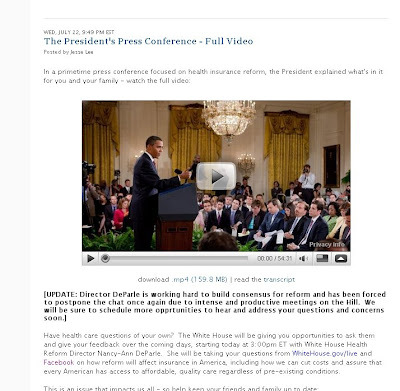 However, with today's press conference on healthcare, it looks like the White House is trying out YouTube alternatives that allow for the Creative Commons license, this time with a player from BlipTV. Update: Since posting this story on Virtualpolitik the interface for the online video has been changed to a YouTube player. (See below.) Plus ça change . . .